What the 4th of July Means to Me – President Ronald Reagan | It's the Women, Not the Men! The day of our nation’s birth in that little hall in Philadelphia, [was] a day on which debate had raged for hours. The men gathered there were honorable men hard-pressed by a king who had flouted the very laws they were willing to obey. Even so, to sign the Declaration of Independence was such an irretrievable act that the walls resounded with the words “treason, the gallows, the headsman’s axe,” and the issue remained in doubt. [On that day] 56 men, a little band so unique we have never seen their like since, had pledged their lives, their fortunes and their sacred honor. Some gave their lives in the war that followed, most gave their fortunes, and all preserved their sacred honor. What manner of men were they? Twenty-four were lawyers and jurists, eleven were merchants and tradesmen, and nine were farmers. They were soft-spoken men of means and education; they were not an unwashed rabble. They had achieved security but valued freedom more. Their stories have not been told nearly enough. But they sired a nation that grew from sea to shining sea. Five million farms, quiet villages, cities that never sleep, three million square miles of forest, field, mountain and desert, 227 million people with a pedigree that includes the bloodlines of all the world. In recent years, however, I’ve come to think of that day as more than just the birthday of a nation. Absolutely. 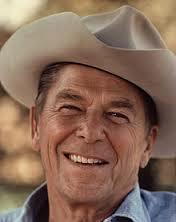 It’s hard to believe that this wonderful American patriot was President just 25 years ago. There’s no semblance of his devotion to God, Family and Country in this current President. And the blame lies solely with the rise of lesbian-led, radical, second-wave feminism and America’s wholesale adoption of its anti-American, anti-Christian, anti-Western Civilization and anti-white men take-over of our public schools. Thank you. It’s simply the truth.